Our son was a huge train fan. His love for trains started when we took him to Train Town in Sonoma, California after his 1st birthday. We rode the train, bought him an engineer hat and it was love at first sight. In the years that followed, we took him to every local attraction that featured a train, gave him his first wooden train set, signed him up as a member of the California State Railroad Museum in Sacramento and became a railroad family. 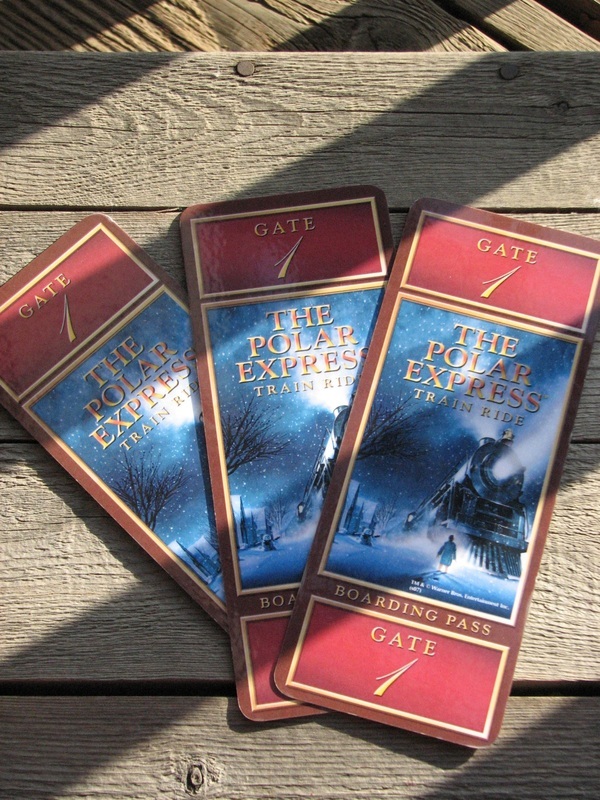 It was the Christmas season of 2009, when my 3 year old son was watching "The Polar Express" movie at home for the first time. He pointed to the conductor on the screen said, "Mom, I want a suit just like that-including the shoes!" It was two weeks before Christmas and I thought, "Gosh, I hope I can do this." So I did what any other mom would do-went searching the web. After finding that the only thing I could buy was an engineer costume with overalls and hat, (of course he already had that), I decided to make my own costume. I shopped around for the pieces I could put together to make up the suit, searched for the perfect buttons and just days before the big event, found a pocket watch in an antique shop on Railroad Square. That first suit with all of the accessories set us back about $200 but it was all worth it when on Christmas morning, he opened a large box containing his very own "Polar Express Conductor Costume." His eyes lit up as he touched the over-sized shiny gold buttons and realized that the pocket watch was "real." He immediately put on the entire suit and wore it proudly for the rest of the day. He wore that "uniform" countless times to every train museum, train show, special event and basically everywhere we went including the grocery store. He even wore it for Halloween and won the best costume contest. The overwhelming attention he received while wearing his costume was amazing and provided many magical experiences. How I got into the Train Conductor Suit business. Whenever he wore the costume we would be asked countless times, "Where did you get that costume? How can I buy one?" So in the summer of 2010, I decided to invest the time and money, (yikes! ), and went about creating Conductor Costumes so that we could share the magic with other families. I took a huge chance, drained my small savings account and started out by selling 3 suits on Ebay. I sold my first costume within 48 hours. After that sale, I bought more supplies and kept repeating the process. Then two weeks before Halloween, I ran out of supplies and had more orders than I could fill. Luckily, it all worked out and I am proud to say that there were more than 20 children dressed as the "Polar Express Conductor" throughout the USA that Halloween. We have put together this costume set using high quality items and it will last until your child "grows out" of it. The gold buttons are tightly sewn on by hand using double thread. The Conductor hat is comfortable and has a piece of elastic in the back to make it adjustable for many head sizes-including adults. The pocket watch really works, features a train on the front and includes a chain that attaches to the vest so your child can slip it in and out of their jacket pocket. The child's suit is made of 100% polyester and is well made. I recommend washing all the suit pieces together on a delicate cycle and tossing it in the dryer on a low setting to dry. I washed my sons suit many times and was always amazed and how well it cleaned. The adult vest and suit is dry clean only. If you have any questions about the costumes, please feel free to contact us using the form below. The day I started this website in 2010, my son and husband were working on a huge wooden train track formation that went through the entire house. They would spend every Saturday morning putting together elaborate wooden railway tracks using every piece and accessory they could. Then at the end of the day, everything would get put away and they would start all over the next time. No two tracks were ever the same. It was a tradition that they cultivated together as Father & Son, and it ended all too soon. Our son was determined to be "The Polar Express Conductor" when he grew up and he just might find a way to check that off his adult "Bucket List" someday. I know that a lot of boys outgrow their fascination with trains by the time they are 6 or 7. That time came when he turned 6 and his attention quickly turned to everything "Pirates." Swashbucklers and tall ships replaced the trains. At 8 he announced that he wanted to be a music teacher and that has since turned into a music DJ. Our life is still immersed in the kind of magic and romance that comes with loving trains. And although his interest in trains has disappeared, a little magical moment will present itself every now and then. Like the time we sold his huge collection of wooden tracks and accessories on Craigslist a couple of years ago. As we were putting everything into several boxes, I sadly picked up Thomas and Trevor and started to put them in the box when he put his hand on mine and said, "No Mom. Those are going into my memory box - actually none of the trains go - they are for when I have kids." I started to cry and he hugged me. It was a magical and tender moment. Then there was the time when we cleaned out his room to clear space for the pirate ships and I tossed an old engineer hat into the box. We then took the huge box of unwanted toys to the toy swap at his school. When he came home, I saw that he had picked out the engineer hat and brought it back. He pinned it on his bulletin board in his room and it remained there for awhile. Later we transformed his room into a Pirate Captain's Quarters and he loved it. Now he is 10 and we are on task to create a "Music Room" for him complete with amplifiers and Disco balls. I embrace the older boy and love that we are on yet another adventure together. Whether it's Trains, Pirate Ships or Electric Guitars - "It's Still a Wonderful Life." -Gay Lynn, The Train Conductor's - er, I mean the Pirate Captain's, no - The Music DJ's Mom.